Sometimes quilters are called upon to use their superpowers for other applications...like sewing a small clutch purse to match an outfit. This one took almost twice as long as it would have to piece a king-sized quilt...and in the end, I'm not sure I even like it. But it's a good size . I used fabrics from Hoffman's "Clarabelle" collection, which I found at Mrs Pugsley's Emporium. 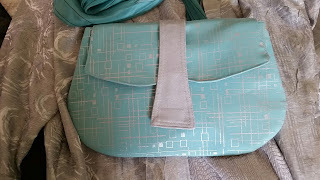 I also found the canvas and heavy-weight interfacing there that I needed to use for the base of the bag. I love that fabric. Why don't I have any, I wonder? Blue Calla Patterns is a Canadian designer, with some free clutch patterns on her site, in case you feel inspired again. I know what you mean about the time it takes. I have been working for 3 weeks on the same small bag. What a sweet little bag! Love it! I took a peek at the instructions and yes, a bit fussy. I will be checking out everything at Mrs. P's on Friday. Can't wait! Very pretty! I'm glad you're using your super powers for good.